Annual herb from a taproot; stems decumbent to erect, much branched, more or less glabrous, 10-60 cm tall. Basal leaves soon deciduous; stem leaves linear to oblanceolate, stalked below to unstalked above, 2-6 cm long, 5-10 mm wide, entire, glabrous or fringed with stiff hairs on the margins. 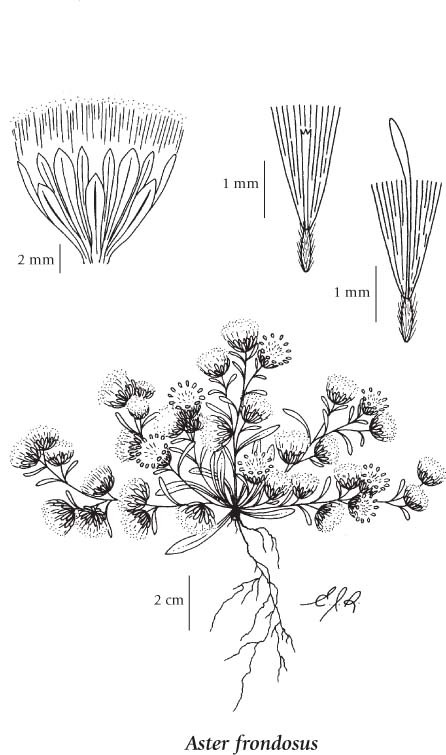 Heads with ray and disk flowers, several to numerous in an open or spikelike, branched inflorescence; involucres 5-9 mm tall; involucral bracts subequal to moderately graduated, linear-lanceolate to linear spoon-shaped, the inner pale-margined, the outer leafy, the tips obtuse; ray flowers white, drying pinkish to pink-purple, 1.5-2 mm long, barely exceeding the disk flowers; disk flowers yellow. Achenes appressed-hairy; pappus white, surpassing the disk flowers. Although this species was first collected in 1939 and reported by Eastham (1947) from the Okanagan Valley, it was not recollected again until 1993 along Osoyoos Lake. Moist lakeshores in the steppe zone; rare in SC BC, known recently only from Osoyoos Lake; S to UT, AZ, NM and CA.